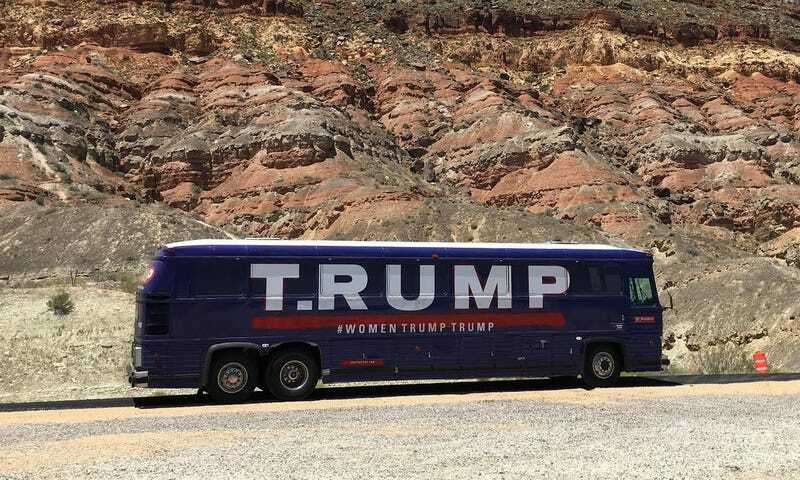 Republican presidential nominee Donald Trump’s campaign bus from the Iowa caucuses went on sale last year for $15,000. I didn’t know who bought it, but it turns out a couple of Republican policy-criticizing artists called t.Rutt did. And they’ve turned it into an anti-Trump installation piece called T.RUMP. Trumpian lair. Why does that sound like a place where smiles and reason go to die? As it turns out, before the bus had anything to do with Trump, it was used primarily for bachelor parties. There’s a stripper pole inside and the tables in the front have been reinforced for table dancing, according to this interview with t.Rutt on VICE. And you know what? That’s an oddly fitting previous life for this bus. Trump Was Very Twitchy and Fidgety During the Debate! Let&apos;s Play What Car Is Trump Tweeting About?